And welcome thee, and wish thee long. 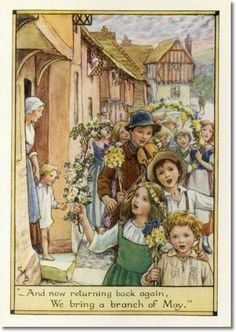 The first of May, by all its names and traditions, is a day marked for its flowers and frolicking, even if, as Shakespeare wrote: “Rough winds do shake” its “darling buds”. For the Druids of the British Isles, Beltane was celebrated to honor the sun, marking the halfway point between the vernal equinox and the summer solstice. Bonfires were lit, usually on the eve of May 1st, smoke and ashes thought to have a cleansing and protective influence. Like Samhain (November 1st), it was a very important festival. Some say the tradition of a pole decorated with flowers, dancers weaving its ribbon streamers intricately together until knotted, began with the pagans. 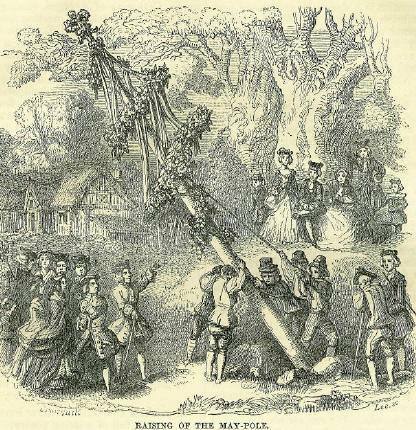 As innocent as it seems, the May pole is a phallic symbol, which ties in with the day’s theme of the fertility of spring for plants, animals and humans. The May bush, made of hawthorn, rowan or sycamore, was decorated with flowers, ribbons, cloth streamers, even eggshells and candles. 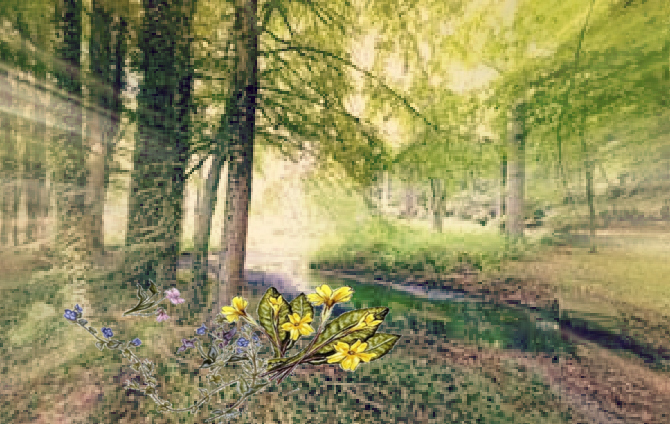 “Long life and a pretty wife and a candle from the May bush.” Yellow flowers, like primroses, gorse and marsh marigolds, were tied into crosses to be hung over doorways and laid on windowsills and doorsteps to encourage abundance. The Green man was a masculine ‘face’ covered in leaves and shrubbery, often carried through towns and villages. Feasting took place, food and drink offered to the spirits of nature like fairies or elves. May’s beginning was a celebratory time for the Romans, too. 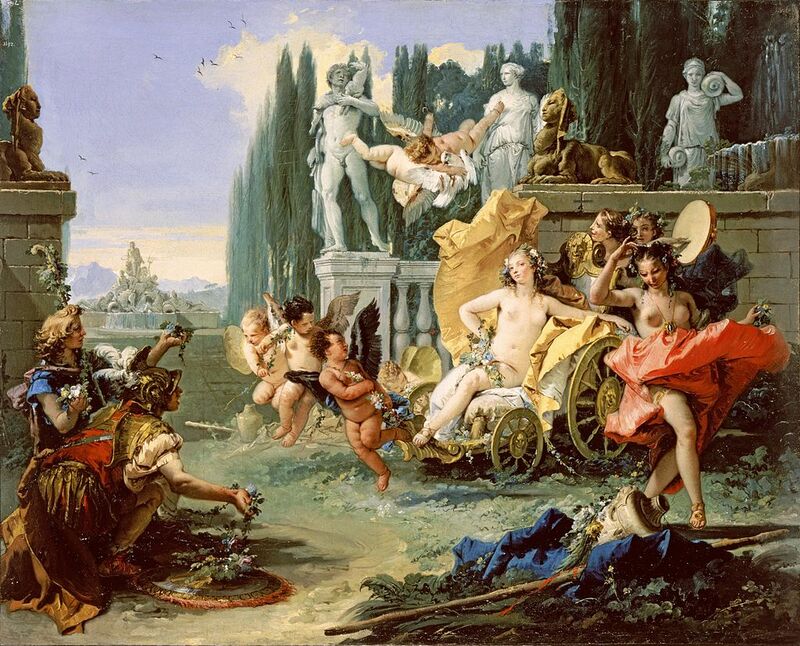 They called it Floralia: five days from April 28th through May 2nd with much wanton gaiety in honor of their goddess of flowers and fertility, Flora. In Medieval times, ‘a-maying’ welcomed the dawn with the gathering of flowers and foliage, and women washing their faces in dew to improve their looks and encourage men to pursue them. 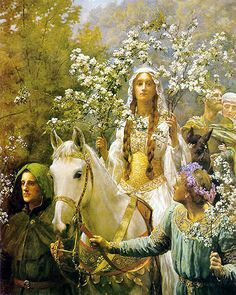 A Queen of the May was crowned, a blending of her origins as the flower bride, queen of the fairies, the Roman goddess of springtime (Maia), and Maid Marion from the tales of Robin Hood; in all these guises generally representing purity and the potential for new life. 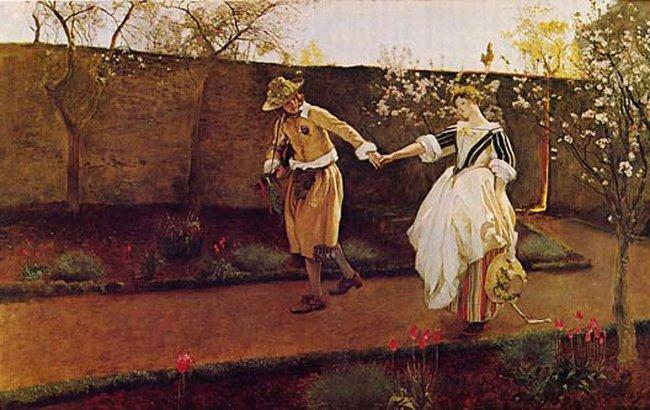 In the puritanical mid-17th century England, May Day was outlawed for a while, a censor the Puritans took to America. The Catholic Church attempted to outlaw the May initiations, but eventually absorbed its pagan rites into its own in order to win converts. May Day as ‘Labor Day’ and “International Workers Day’ is marked by a bank holiday in many parts of the world, but not in the US or Canada (instead moved to the first Monday in September), probably because of its association with communism and socialism, which certainly doesn’t prevent Americans and Canadians from welcoming and appreciating this day that, no matter sunshine or showers, warm or cold winds, insists winter is finally over. All day she had tried to ignore what was going on out-of-sight but not earshot, unable to deny the appeal of laughter, lively music and singing inspired by the beribboned pole she had watched going up the day before. She didn’t take part, except to secretly act out one of Martha’s reminisces of being young and wanting to look her best for any possible sweetheart. “Wash in dew from the hawthorn tree, and will ever after handsome be.” Martha also suggested collecting it from ivy leaves or the grass under an oak, emphasizing that it had to be done at or just before sunrise. Donatella took a bowl outside before Martha had arrived and Mama was up. It filled a little as she shook the ivy that hung along the cottage’s front door, the leaves of some kind of thorn at one end of the garden, and the grass she pulled up from under the oak tree at the other. Not sure the dampness everywhere wasn’t from overnight rain, she felt silly and hoped no one saw her running around barefoot and rubbing her face and neck. Wishing all a very Merry Month of May! 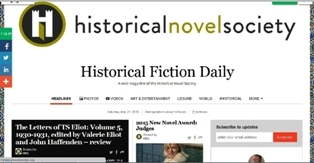 We’re crowdsourcing: submit your poem! Poets! Here’s a chance to see your poetry published in a beautiful anthology (Bennison Books publications are always first class) AND contribute to The Book Bus, a very worth charity. Follow the link to learn more and how to submit! 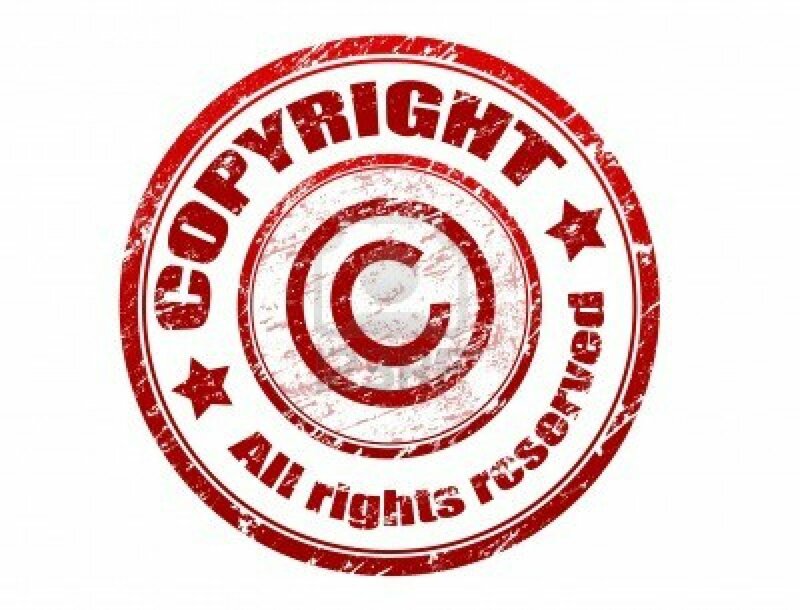 Bennison Books is crowdsourcing poetry! No, we don’t want your money: we want your words. My little way of honoring Earth Day, with gratefulness for the flowers that have graced and healed me with their beauty, wisdom, and playfulness. I continue to be inspired by nature, am blessed to be surrounded by it, always aware of how it deserves my utmost care and attention, which often means inattention as it knows best how to care for itself. Except as it has been sorely injured and needs our help in healing. So, leave those dandelions! Be nature’s best friend: have the ‘worst’ lawn in your neighborhood. “Not a single bee has ever sent you an invoice. And that is part of the problem – because most of what comes to us from nature is free, because it is not invoiced, because it is not priced, because it is not traded in markets, we tend to ignore it.” ~ Pavan Sukhdev, United Nations report, The Economics of Ecosystems and Biodiversity. Today lavender is a popular flower and herb. Taken only for its beautiful appearance and clean calming scent, it deserves the attention. For protection, Christian households would hang a cross made of the herb over the door, a tradition possibly explained by the legend that Mary hung baby Jesus’ clothes on a lavender bush to dry. 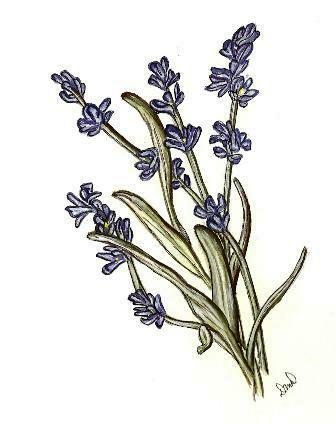 The Greeks used lavender as a remedy for various ailments including muscle ache, insomnia and insanity. The Romans loved using the plant in their bathing rituals, believing it purified the body and soul. They gave it its name, derived from the Latin “lavare” which means “to wash” and introduced it to the English. During plague epidemics it was credited with warding off the disease, often with a sprig fastened to each wrist. In Medieval and Renaissance Europe, servant women who washed in lavender water, placed lavender in linens or draped laundry on lavender bushes became known as ‘Lavenders’. The lowliest of these were sometimes reputed to be prostitutes. Donatella overslept the chance to be the first to find Golone anything but vigilant on his master’s couch. Still, she was glad the doctor had returned to Alessandro sitting up insisting on caffè forte and a brisk walk to knock the demoni from his head. Alessandro’s head dropped into his hands and a slow moan. “You see.” Donatella stroked his pillow. “I thought it was a spell.” Alessandro fell out of the conversation, avoiding the awkwardness he wouldn’t have felt anyway, always as if unconscious of his sins and anything surrounding him that wasn’t his choosing. So Donatella stayed, for the unknown and contradiction of those senseless moments. She sat by his bed in the safety of friendship, and even for virtue, rubbing his temples with lavender, knowing she might never have such intimacy with him again. Donatella washed in the suggestive scent of lavender water and changed her underthings behind a screen. She emerged, as her mother commented, like someone condemned. She couldn’t avoid the tight-lacing of her corset, but refused to be dusted with chalk and cerise powder and most adamantly to her lips being stained with crushed cochineal. Too much midnight-blue fabric shimmered and swept around and behind her. Her bosom was flattened, her waist elongated, and the ruffles of a new chemise, thinner than any she had worn during Genoese summers, showed flirtatiously on her lower arms and through the slashed and puffed tops of her sleeves. I can’t let the day pass without ‘mentioning’ that it is Alessandro Stradella‘s birthday (April 3, 1639, Nepi, near Rome, Italy). In the three and a half years since the publication of my historical fiction A House Near Luccoli, I have certainly noticed more interest in and attention on Stradella and his music. In January of this year, BBC Radio 2 broadcasted How to Flee From Sorrow* – Behind (Stradella’s) lovely, well-ordered music was a life bursting with ambition and starved of security. The program’s musical director was Alberto Sanna, musicologist and violinist, who recently released the first-ever complete period-instrument recording of Alessandro Stradella’s beautiful yet neglected Two-Part Sinfonias. *Follow the link for a wonderful and insightful piece about Stradella by the program’s writer, Frank Cottrell Boyce. Unfortunately this program is not available to listen to at this time, but, hopefully, will be again in the future. The composer’s arrival at a house near Luccoli in April 1681 put a cat among pigeons. She smelled a candle burning, but it didn’t light the short hall. In the main room a window was open, with the settee moved closer to it, Signor Stradella a masterpiece resting there. One dark leg was stretched and falling over the back of the couch, a ruffled hand on its knee; the other bent to the floor and, even without stocking and shoe, appeared ready to walk away. He had also undressed to his shirt still buttoned high and wrinkled softly because it was made of the finest linen. A slight breeze blew his hair over his face. As he realized her burdened entrance, his right shoulder pillowed a half-smile and he reached out lazily. “What’s that?” She clumsily laid the tray down on the gray marble hearth, not wanting to bend with her back to him. “It’s the weather.” Donatella offered him a drink. She was still holding the folder. He moved slowly to make space on the table where his inventions were layered and sprawled, so many at once. 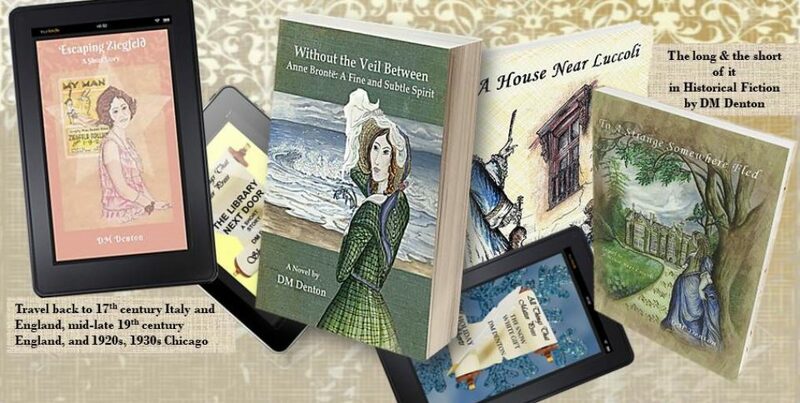 By the time she placed the copy there he was sitting once more, leaning forward, his head in his hands. “Ah. I’ll make it so.” His teeth showed. “Così.” He leaned over the table, the side of his face long and angled, eyelashes still and mouth taut, the first page flipped for the second, the second for the third, every one after that as unremarkable. Her hope of impressing him was gone. She had to consider. His reputation. Her motivation. She couldn’t sign her name to the work, freely spend any payment, or even show some pride. Sneaking around, her aunt would eventually find out and put a stop to it anyway. “Oh.” She rescued the plate. He took a slice, eating it almost without chewing. “As we live dangerously opening windows.” He reached for another, nodding for her to take what was left. “Oh, yes.” She broke a corner of the last piece on the plate. He got up to pour her a glass of limonata, staring as her lips, covered in crumbs, finally took a sip. Despite the circumstances that dictated the ending of the novel, Stradella continues to influence hearts and conversations in its sequel To A Strange Somewhere Fled. She made her mark as unexpectedly as before, becoming more and more involved with its swirling and sliding and dotting, rising and falling with her shoulders and satisfaction. She was definitely possessed by a melodic hum and laughter in her head, the tease of a draft on her neck, and the surprise that she hadn’t forgotten how to serve a master. She knew he was smiling as she checked her work, a mistake here and there repentantly fixed, page after page turned into another chance to show that, in theory and practice and ways she didn’t need to understand, she was worthy of his presence. Yes, it felt like he was there, pacing the room and wringing his hands as he realized he couldn’t change anything. She could, with his permission. 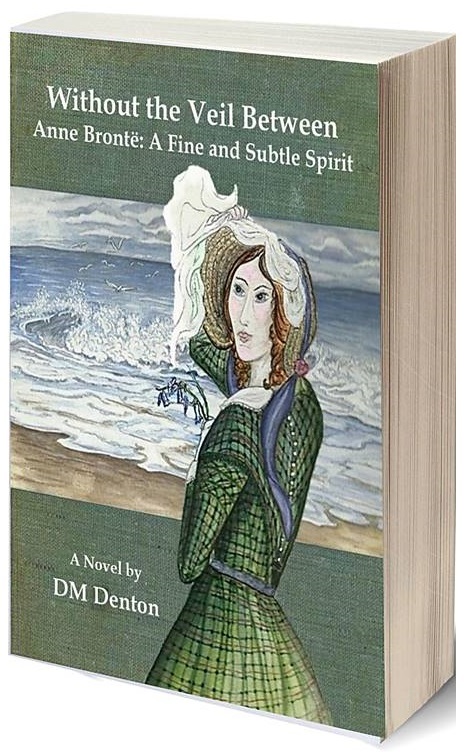 What else allowed her to hear a note held longer or twilled higher, a crescendo misplaced, or toccata written more for poetry than a harpsichordist’s dexterity? What would have put such ideas in her head, except the desire of one who had touched her with his variations? There was the appropriate silence before Lonati was as elegant and amiable with bow and violin as no other activity afforded him. With every stroke, nod and faraway expression, he was an echo of Alessandro, exacting the very best from the composition and the late composer’s nature, generous with his talent, uninhibited with his playing, making the music his own only as he adored it. His reminiscent virtuosity swept Donatella onto the waves of Le donne più bella like a ship with a steady breeze in its sails, Reggio’s archlute-continuo encouraging the rolling sensation. It looked as though Master Purcell was trying to hide under the stairs. Roger inquired about his journey from London and he emerged to reveal that he had interrupted the trip with a night at Oxford and much drinking, and another at Rousham Park and even more feasting. “And I hope you’ll pardon me, Harry, but the guests will soon arrive and you need to tidy yourself and prepare.” Roger didn’t know he showed concern for anything but the plan for the evening ahead. They walked into the hall and Donatella wanted to tell him about the man she had known as reported but, also, in very different ways. Would Master Purcell believe Alessandro had been in need of friendship more than love, or that he had grown tired of making music for those who only listened to their own importance? Would it seem as ridiculous to say he would have rather roamed the streets, lost in the crowds and songs of Carnival, than found to be wanting in nobler society? She could describe him as flamboyant in disguise and excessive when it came to enjoying himself, yet he had the sense to be gracious in his manners, and even humble when it weighed in his favor and, especially, his purse. 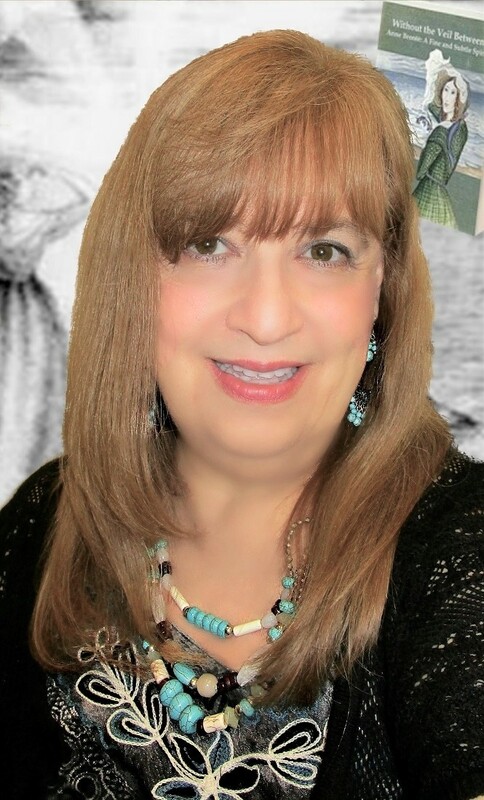 She might also reveal the unshaven, disheveled creature that growled with frustration and cursed the affairs that caused him more trouble than they were worth. Surely, Master Purcell would rather hear about Alessandro’s genius and even his sacred purpose: how the music came to him like the archangel Gabriel, because he was highly chosen with or without the patronage of any prince or princess. I “knew” Alessandro Stradella. I recognized his distinct voice, his swaying form, his infectious smile, and his wandering heart. I had witnessed the rise and fall of his talents, how his music had showered him with forgiveness if not fortune.